The Folder Self Service allows quick setup of shared folders for authorized users within the network. The data Storage allows the automatic moving of unused files from the file system. Welcome to the online manual of migRaven! migRaven is the tool for easy migration of complex file server structures while building the necessary Microsoft-compliant NTFS permissions. 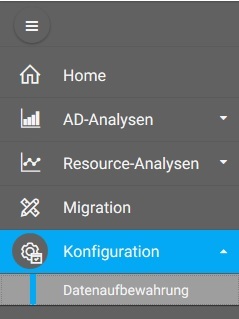 In the header menu you will find the individual steps for migRaven 5.0 and migRaven 24 / 7. For example, click on 24 / 7 to complete all the necessary steps for the free trial and buy version. With a click on menu you can display an overview of the individual contributions. Under FAQ Find suggested solutions for known cases and problem situations. Do you have any questions and are you stuck somewhere? If a project is on -1, eg because saving was not completed correctly, it can be adjusted in the database. In order to use a foreign database, some adjustments have to be made in the database itself. For this, all local machine names must be adapted. The Folder Self Service allows exchange folders with a set authorization for individual users, a group or a user migRaven Create role. The corresponding folder is automatically created in the live system, authorized accordingly and will be deleted after a predefined time, as long as its term is not extended. After the scan, the data is stored in the Neo4j database. Once this process is completed (saves to Db) the project should be set to 0 status, before that should migRaven under no circumstances be terminated. In order to exclude desired paths, folders or files from the scan, the respective values ​​must be entered here. All projects that are scanned or rescanned after this change are subject to the filter. Depending on the configuration of migRaven, it is recommended to adjust the heap size in the database config, otherwise there could be difficulties with the saving process in the database. This function provides the administrator or authorized data owner with an archiving function for the created projects and their content. The selected folder including all files and subfolders will be transferred to the specified path. At the same time, a symbolic link is created in the original folder which directly points to the new UNC path. The use of symbolic links is not active by default and must be activated.